Duluth, Minn. & Knoxville, Tenn. (4 April 2018) – The National Aeronautic Association (NAA) announced this morning that the Cirrus Aircraft Vision® Jet has been awarded the 2017 Robert J. Collier Trophy for developing the world’s first single engine Personal Jet™ and implementing the Cirrus Airframe Parachute System® (CAPS®) on the aircraft. The Collier Trophy is selected by a committee that includes 25 industry leaders and is awarded annually to recognize “the greatest achievement in aeronautics or astronautics in America, with respect to improving the performance, efficiency, and safety in air or space vehicles, the value of which has been thoroughly demonstrated by actual use during the preceding year.” The nine nominees this year included the Edwards Air Force Base F-35 Integrated Test Force, Boeing 737 MAX, NASA/JPL Cassini Project Team and more. As the world’s first single-engine Personal Jet, the Vision Jet created a new category in aviation and further defined its significance with the inclusion of the Cirrus Airframe Parachute System (CAPS). Unique to Cirrus Aircraft since the launch of the first SR Series aircraft in 1999, CAPS is the first FAA-certified whole airframe parachute system included as standard equipment on an aircraft and has continuously redefined safety in aviation. The inclusion of CAPS on the Vision Jet marks a major engineering milestone in the design and development of jet aircraft and signifies the ability to further transform aircraft safety at heights and speeds never before imagined. Throughout the history of powered flight, the NAA has been the steward for the nation’s most prestigious aviation awards. As the most notable of these awards, the Robert J. Collier Trophy was first awarded in 1911 and represents a historical timeline of the most celebrated advancements in flight and air safety around the world. Past recipients include Orville Wright, Neil Armstrong and the Apollo 11 team, Chuck Yeager and the Bell X-1, Lockheed’s Skunk Works and the F-117A Nighthawk stealth fighter, Boeing 747, Bell Boeing V-22 Osprey, B-2 Spirit, F-22 Raptor, Boeing 787 Dreamliner, Gulfstream 650, Blue Origin and many more aviators, scientists and engineers responsible for progressing aviation for generations to come. 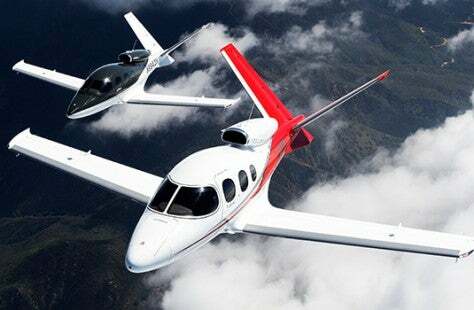 The Vision Jet received FAA certification in 2016 and immediately ushered in a new era in personal aviation as the world’s first single-engine Personal Jet. The turbine aircraft features a spacious, pilot and passenger-friendly cabin with panoramic windows, reclining seats and comfortable legroom to accommodate five adults and two children. The cabin is complemented by the Cirrus Perspective® Touch™ by Garmin® Flight Deck, which delivers a wide array of sophisticated and intuitive global navigation capabilities and safety features at the touch of a finger. The Collier Trophy will be formally presented at the Annual Robert J. Collier Trophy Dinner on June 14, 2018 at a location to be announced. It is on permanent display at the National Air and Space Museum in Washington, D.C. For more information, including a full list of past recipients, visit www.naa.aero. Cirrus Aircraft is the recognized global leader in personal aviation and the maker of the best-selling SR Series piston aircraft and the Vision® Jet, the world’s first single-engine Personal Jet, as well as the recipient of the 2017 Robert J. Collier Trophy. Founded in 1984, the company has redefined performance, comfort and safety in aviation with innovations like the Cirrus Airframe Parachute System® (CAPS®) – the first FAA-certified whole-airframe parachute safety system included as standard equipment on an aircraft. To date, worldwide flight time on Cirrus aircraft has passed nine million hours and 150 people have returned home safely to their families as a result of the inclusion of CAPS as a standard feature on all Cirrus aircraft. The company has three locations in the United States, located in Duluth, Minnesota, Grand Forks, North Dakota and Knoxville, Tennessee. Find out more at www.cirrusaircraft.com.